Sixth-grader Gaby Ramirez Howard loves cats and storytelling. When an ICE raid breaks out at the factory where her mother works—resulting in her mother’s deportation back to Honduras—Gaby is left in the care of her father, whom she does not know well and who does not seem too interested in parenting. “No, Mom! I’ve been patient. I’ve been patient for three months! And stop calling me your princesa. If I were your princesa, you’d be here. You said before that I was worth the journey. I’m your daughter and I want you to come back! You promised!”…. The silence that followed sent a sharp pain through Gaby’s whole body. How could she hang up on her mom? She ran out the front. Her father yelled after her, but she wasn’t stopping. Gaby’s outburst reveals that her mother’s absence—even though it is certainly not her fault—has ruptured the unspoken expectations between parents and their children. Parents are expected to take care of their children and, at this moment, Gaby blames her mother for her inability to do so. I found this particular scene painful to read because it’s the broken immigration system that thrives on separating families and making it extremely difficult for parents to parent. As a result, the children are left feeling abandoned and unworthy. And while Gaby is furious, she is also sensitive to her mother’s difficult situation and feels a sense of responsibility to keep herself together for her mother’s sake. This separation of mixed status families changes their dynamics and roles: Children are often forced to mature early and parents who have been deported must find new ways to parent. Because of this dynamic, Gaby does not let her mother know how much of a hard time she is actually having; and rather, she becomes a nurturer. While dealing with her own family situation, Gaby, as part of a class project, volunteers at an animal shelter. She becomes responsible for creating flyers with stories about the shelter animals in hopes that someone will read them and give the animals a home. 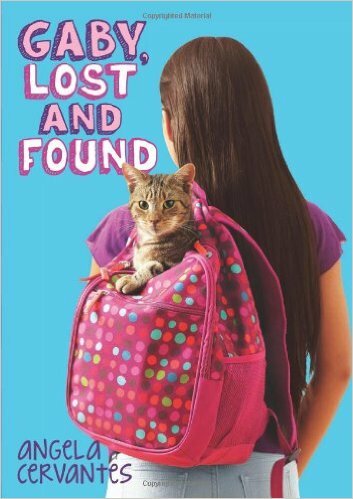 When Gaby encounters a cat abandoned by her neglectful owners, she steals the cat from the shelter and takes it home with her. Gaby, who feels abandoned herself, vows to nurture her new cat the way she wishes someone would nurture her. Cervantes's narrative details Gaby’s downward spiral due to her mother's deportation, which has stolen the child’s sense of security and has traumatized her. After the deportation, Gaby sleeps by the door with the phone under her pillow so she doesn't miss her mother's return. She is not eating well, and she begins to push her friends away. But by the end of the novel, Gaby is in a much better state of mind: She has a better understanding of how dangerous it would be for her mother to attempt to cross Guatemala and Mexico to get to Kansas City, and she finds comfort in knowing her mother is safe and in knowing that her mother will love her despite the distance. As xenophobic immigration laws have negatively impacted many, many mixed status families, Gaby’s story remains painfully relevant. Since 2009, more than 2.5 million people have been deported. Indeed, President Obama has deported more immigrants than has any other US President and the numbers continue to rise. In addition, the Supreme Court’s deadlock on DAPA has left many more families vulnerable. Cervantes’s novel does not attempt to provide a solution to the fraught immigration system that has taken Gaby’s mom away; nor does the author give Gaby a neat, happy ending. Rather, Gaby, Lost and Found presents a realistic telling of the fear, anger, and pain involved when a child’s parent is deported. While immigration continues to be a prominent theme within Latinx children’s and young adult literature, many books focus solely on Mexican experiences—and even then, most of them involve “legal” immigration. Luis J. Rodriguez’s América is Her Name was the first Latinx picture book I read that has an undocumented protagonist; and Jorge Argueta and Rene Colato Lainez continue to be the leading authors writing Latinx children’s books that center Central American experiences. There’s a clear need for a broader discussion of immigration in Latinx children’s literature in order to capture and represent the multiplicity of migrant, immigrant and refugee experiences. Gaby’s narrative gives hints to her life with her mother before she was taken away and, clearly, she has other interests. She’s a complex character—a fun, cat loving, regular girl. And it’s also evident that her mom’s deportation will impact the rest of her life just like it does for real Latinx children whose parents have been deported or face deportation. Gaby, Lost and Found is the first Latinx children’s literature novel I’ve read where a parent is deported and does not return. It’s compelling because it captures the reality impacting many young Latinx living in mixed status homes. And, while providing an ending in which Gaby and her mom are happily reunited might have been satisfying for many young readers, my concern is that such “happy endings”—by resolving everything at the end—might serve to minimize the severity of the issue and to alienate children whose parents have not and cannot return. Here, by staying away from a too-neat and too-happy ending, Cervantes points out the long-term implications for families that have been separated by an immigration system that fails our families. Cervantes’s novel addresses issues related to mixed status families including deportation, and Gaby is indeed a multi-dimensional character whose story extends beyond her mother’s deportation. Gaby, Lost and Found is a much-needed addition to conversations around Latinx literature and immigration. It’s an extraordinary story, and is highly recommended. An earlier version of this review first appeared on Sonia Alejandra Rodriguez’s blog: https://soniaarodriguez.com/2016/07/05/gaby-lost-and-found-expanding-the-conversation-on-latinx-kids-books-immigration/.